It's full of detailed information about Scala Lift. This technical book explains how to leverage the Lift Web Framework for building real-time, highly interactive and highly scalable web applications. 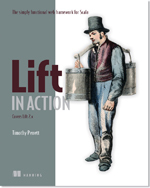 Lift is a relative departure from many other tools avalible today so this book gives an introduction to the concepts and takes the reader from a high-level overview, right down to a low-level discussion of Lift’s HTTP processing pipeline. Initial order numbers have been very strong; reader feedback has also been rather complimentary.